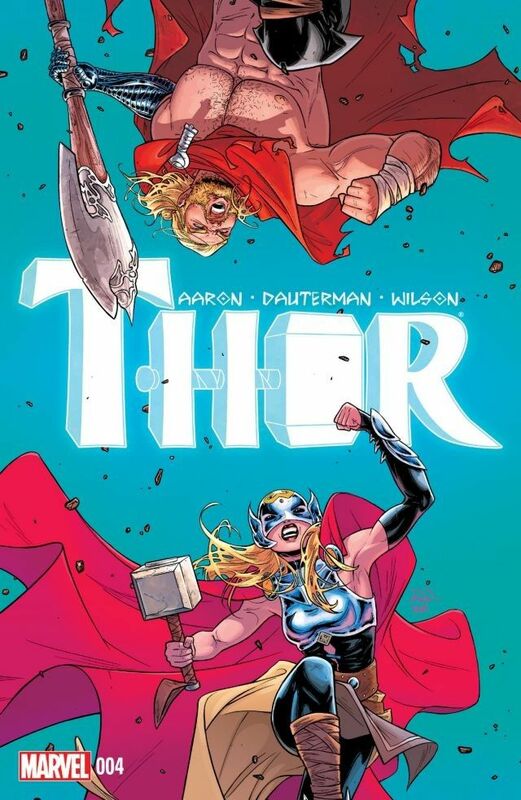 Comic Review: Thor #4 – Thor vs. Thor! The issue begins with a flashback that follows Thor right after the loss of his arm. Odin has no sympathy for him, which doesn’t surprise me; comic Odin is even more of a jerk than movie Odin. Many of the dwarves forged a new arm from him in the same forge where Mjölnir was created, and Screwbeard (the dwarf who delivers it) says that the arm will be here long after the stars turn to dust. It seems like a HUGE output of labor for just one arm, but I guess when you’re the God of Thunder, people will do stuff for you. Thor’s interaction with Lady Thor (I knew this would be a weird review to type up) is VERY stubborn; he is single-minded in wanting to get Mjölnir back. The fight between the two is quite intense, especially when the frost giants involve themselves in the mix. I won’t spoil the outcome of the fight, but the ending of this issue is excellent and, again, makes me want the next one immediately.